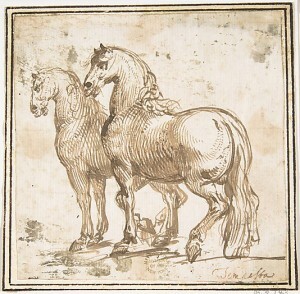 This day is planned much like a day of tutored life drawing in the studio, except that we have horses to work from instead of humans and shall be on a farm. Handlers will do their best to keep the horses still for us. We shall work outdoors if weather is fine, or in a large covered barn if wet. Basic materials are provided (paper, charcoal, chalk, some graphite and other bits) though you are welcome to bring your own.